each of Food, Water, Seed and Tools). 4-6 Married. Those "married" take a spouse and one child token (your choice). continues in clockwise manner (to the first player's left). Players start the journey on the Mormon Trail, which leads them to Salt Lake City. Mormon Trail at the same space where you entered the Experience Trail. count. You might have to wait a few turns, shaking the needed number. give money or supplies as a gift to help another (and collect a blue blessing token). to pay the debt. Volunteered help is never repaid. Prices card to determine the value. The Bank will pay cash for items. BLESSINGS:  1. Shake the die and collect money 3 times the number from the Bank. 2. 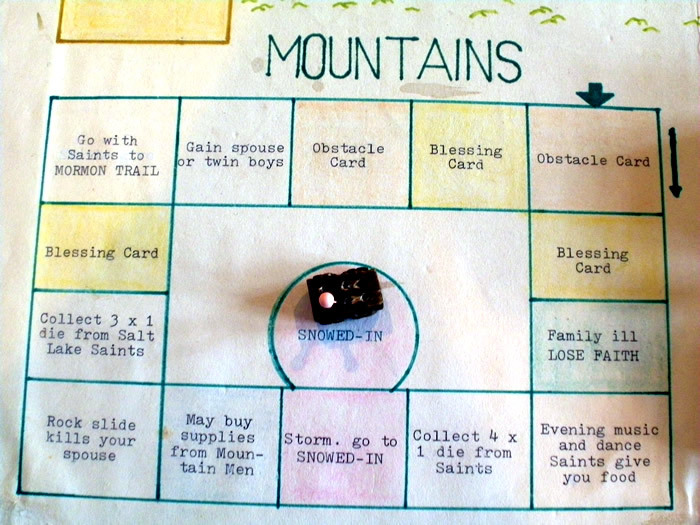 Take a yellow Blessing card and follow its directions. 3. You may buy any number and kind of supplies you want (only what you can pay for). OBSTACLE:  Take an orange Obstacle card and follow its directions. 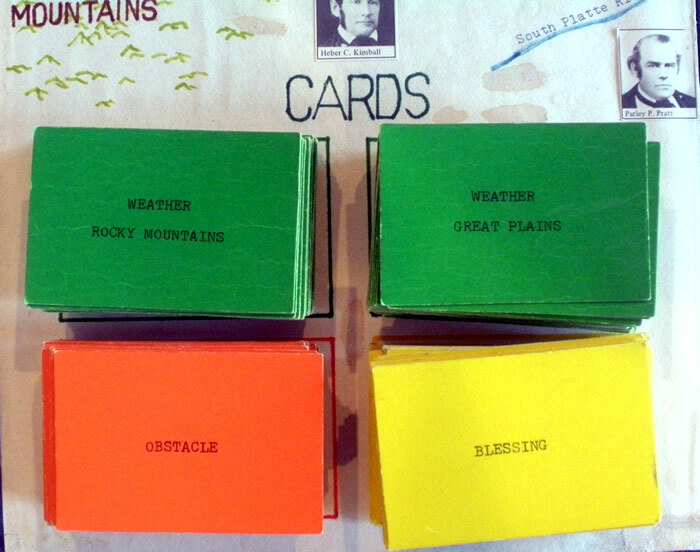 Weather retention card. The card offers either an easy (free) fordage or passage. (MOB; INDIANS; MOUNTAINS). An arrow shows where to enter the trail. MAY BUY SUPPLIES:  According to how much money you have, you may buy new supplies from the Bank. family members and a maximum of 4 items. Each horse may carry a maximum of 2 items. cannot own more than 1 wagon at one time. LOSE FAITH:  You may renew faith by 3 ways. faith. Return it to the discard stack. 1) Money 3 x 1 die. 3) 2 supply items of your choice. is not given because you chose to procrastinate. Sacrifice either 1) Money 5 x 1 die or 2) 1 horse and 2 supply items of your choice. token. You may again decide to renew faith IMMEDIATELY or to PROCRASTINATE. faith before receiving a SECOND Lose Faith token. 3) 2 supply items of his choice. Blessing token from the Bank. The assited player may not collect a Blessing token. The assisted player does not repay any offered help. 1. Shake 1 or 6 on the die. 2. Pay a fine if he does not shake a 1 or 6. Move back to the space adjacent to the circle after paying the fine or shaking 1 or 6. LEAVE AN EXPERIENCE TRAIL:  When a player stops ON this space, he may return to the Mormon Trail. players or to the Bank. Supply items and animals CANNOT be sold. you give Abandoned items to the Bank. LOSE OXEN:  A wagon cannot move without oxen. 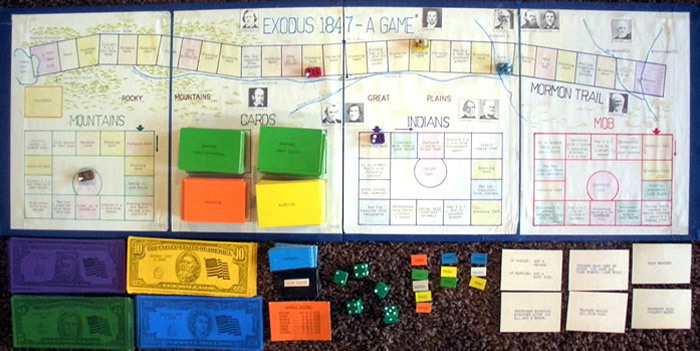 A player may declare Hardship when oxen are lost. 1 blue Blessing token IF any player can accept an item you abandon. abandon all the supply items that your horses cannot carry. 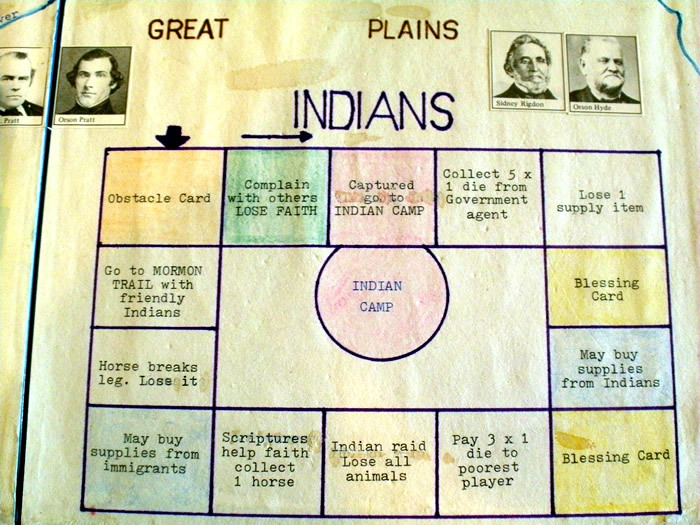 game board. He Abandons supply items that his horses cannot carry (if the wagon is lost). Other players may accept his Abandoned items, and he then may take 1 blue Blessing token. the items are lost before he moves OFF his present space unless he declares a Hardship. according to the standard price. He CANNOT buy supply items or horses. from the Bank (only 1 per turn). 1. Gain a new spouse or child. 2. Share offered supply item with another player. 3. Offer Abandoned supply item to another player. Blessing tokens are never lost in the game. DOUBLE BLESSING:  A player may collect 2 blue Blessing tokens. card is taken EVERY turn. Rock. 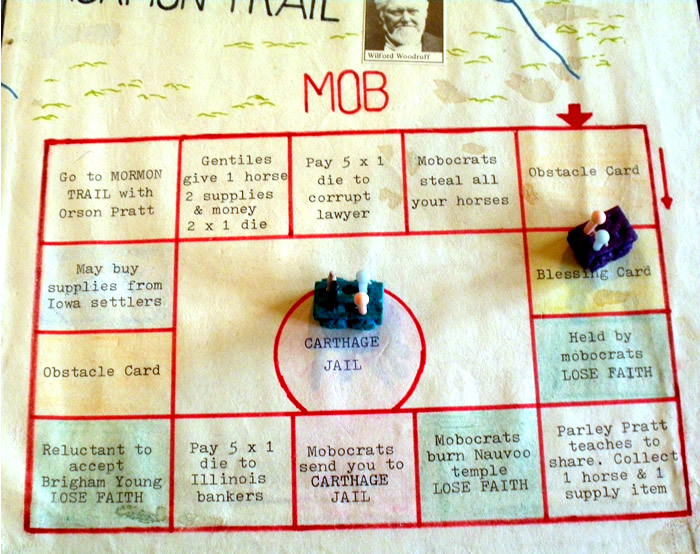 Also use the cards while you are on the MOB Experience Trail. the INDIANS and MOUNTAINS Experience Trails. Camp or Snowed-in spaces. Take a Weather card EACH turn, even if you cannot move. animals EACH turn that you cannot move. player who is FULLY prepared enters Salt Lake City. 1. Any who Lose Faith and cannot renew it. helped someone along the Trail. California, as Brigham Young often recommeded. HINT:  Keep supply items below each Horse and 1 Oxen token to help you remember where they are. barrel breaks. Water on a Horse is not lost. people may help us successfully cope with our problems and challenges. I hope you enjoy this game, whether as a family or a group or friends.